All good things must come to end. Constant Listener, and not even Stephen King can write a story that goes on forever. The tale of Ronald Deschain's relentless quest for the Dark Tower has, the author fears, sorely tried the patience of those who have followed it from its earliest chapters. But attend to it a while longer, if it pleases you, for this volume is the last, and often the last things are best. Roland's ka-tet remains intact, though scattered over wheres and whens. Susannah-Mia has been carried from the Dixie Pig (in the summer of 1999) to a birthing room -- really a chamber of horrors - in Thunderclap's Fedic Station; Jake and Father Callahan, with Oy between them, have entered the restaurant on Lex and 61st with weapons drawn, little knowing how numerous and noxious are their foes. Roland and Eddie are with John Cullum in Maine, in 1977, looking for the site on Turtleback Lane where 'walk-ins' have been often seen. They want desperately to get back to the others, to Susannah especially, and yet they have come to realize that the world they need to escape is the only one that matters. Thus the audiobook opens, like a door to the uttermost reaches of Stephen King's imagination. You've come this far. Come a little father. Come all the way. The sound you hear may be the slamming of the door behind you. Welcome to The Dark Tower. Sad my journey to the tower is over but totally enjoyed it! Loved both narrators that I traveled with! Only Stephen King could create such a vivid and amazing work and bring it to an ending as such. You are a master of your craft. 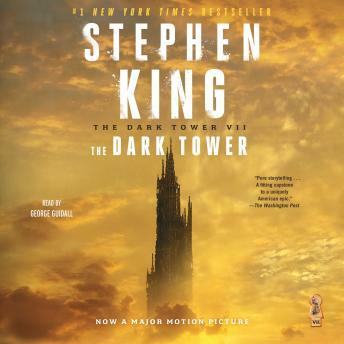 I thoroughly enjoyed each novel of The Dark Tower and have others listening as well. I'm sad that this was the last..but what a way to end. Never saw it coming. Superb!! Great series! Great edge of your seat adventure! Crazy and unexpected ending! Great book and a great ending to the great series. Stephen King puts stories together like no one else. Great book and a great ending to the series although a sad one. I cried throughout knowing this was the last book in the series. It was heartbreaking to know the series was coming to an end. I loved it. Simply loved the series and the characters. Stephen King is amazing. I have been a follower of Roland since before the turn of the century. Second time reading and just as great!!!! Never wanted it to end.